A 1954 article in Women’s Wear Daily announced the arrival of Patricia Smith’s novel jewelry designs, noting, “highly colored, glamorized nuts, screws, bolts and other industrial products make unusual anodized aluminum jewelry by the new firm of Geomet, Inc.” Though Smith worked previously with modern furniture manufacturer Hans Knoll and Bauhaus artist Xanti Schawinsky, she made the groundbreaking decision to start Geomet, Inc., a firm that produced jewelry pieces and accessories such as this key chain from industrial materials, in the early 1950s. At the time, Smith’s designs, which could be purchased at department stores such as Bonwit Teller, surely were unusual for their recontextualization of found objects. Her work broke many previously-held conventions regarding jewelry’s aesthetics and materials. These characteristics can be seen in this keychain. 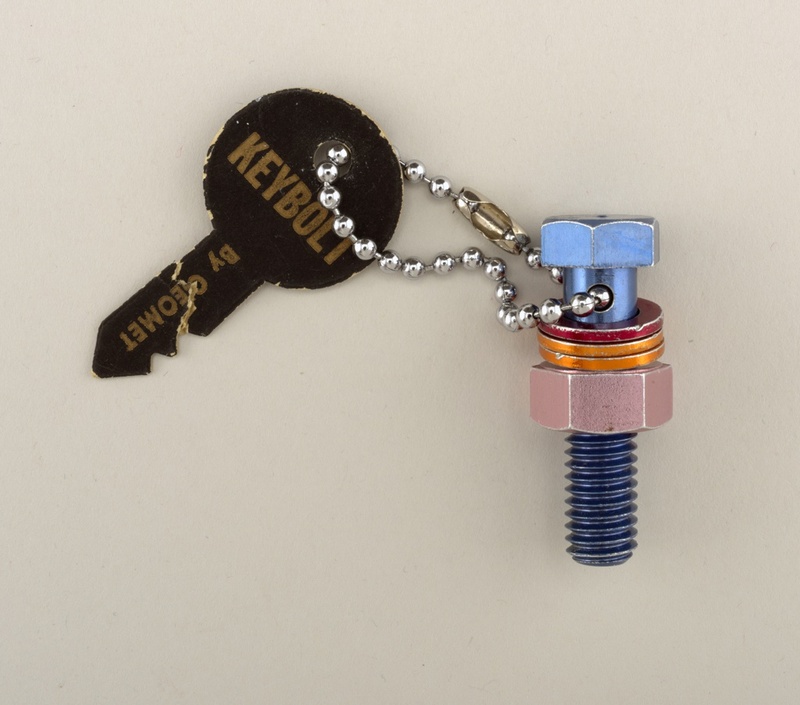 Together, the colorful nuts, bolts, and washers—otherwise mundane items—have been elevated to an aesthetic object for consumption. An Industrial Design article, also from 1954, noted that Geomet inventively turned industrial parts into shapes that “lend themselves to decorative combinations.” Smith’s use of anodized aluminum as well as her sense of lightness and play foreshadowed anodized aluminum designs of the 1980s such as David Tisdale’s Electra flatware, underscoring the true novelty of her work. “Glamorized Nuts, Screws, Bolts,” Women’s Wear Daily, September 17, 1954. Industrial Design 1 (November 1954): 45. Hi I just found a similar piece with anodized aluminum cotter pins. I can’t find much about Patricia Smith or many other pieces except for at this site and Moma. Can you point me to where I can find more about the artist and should I seek an appraisal?